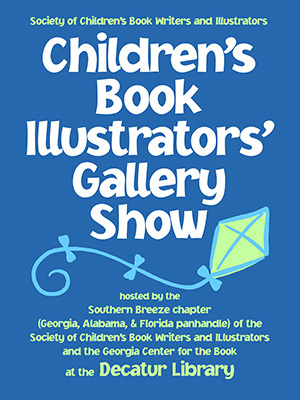 Southern Breeze hosts its Annual Gallery Show for our PAL-tier members during the Decatur Arts Festival weekend (Memorial Day weekend) and for the month of June. Kick-off night is during the Friday Art Walk – Local Decatur Galleries stay open late and attendance is vigorous. Each framed piece of art is accompanied by its currently available for purchase picture book. It is a great introduction to the talented artists in our region who create the books we love! Click here to read about our 2013 show. Click here to read about our 2012 show. Click here to read about our 2011 show. Click here to read about our 2010 show. Click here to read about our 2009 show. Click here to read about our 2008 show (which turned into Storybook Look).